Turnout will be enormous in the election. And that creates lots of unpredictability. WASHINGTON — Our new national NBC News/Wall Street Journal poll provides a "Choose Your Own Adventure" outlook for the midterm elections that are now just two weeks away. The good news for Republicans indicating that they have a shot at retaining control of Congress: President Donald Trump’s 47 percent approval rating is at his all-time high among registered voters (it’s 45 percent among likely voters); they lead Democrats on the economy by a record amount; and GOP enthusiasm continues to grow. And the signs point to a jump ball: In the most competitive House battlegrounds — many of which take place on Republican turf — congressional preference is essentially tied. But there is one unmistakable finding in our poll: Turnout is going to be sky-high this midterm season, surpassing vote totals from previous midterm cycles. And that record turnout means that the eventual outcome in November is likely to be unpredictable. Among all registered voters, 65 percent say they have high interest in November’s elections — registering either a “nine” or “10” on a 10-point scale — the largest percentage for a midterm electorate dating back to 2006 in the NBC/WSJ poll. By party, 72 percent of Democrats say they have high interest in the upcoming election, versus 68 percent of Republican respondents. “Midterms are about mobilization, and we are headed into the stretch run with unprecedented enthusiasm among both parties,” says Democratic pollster Fred Yang, who co-conducted the NBC/WSJ poll with Republican pollster Bill McInturff. What’s more, the percentage of women, Latinos and young voters expressing high interest in the midterms has increased by double digits from their average in the past NBC/WSJ polls this year. 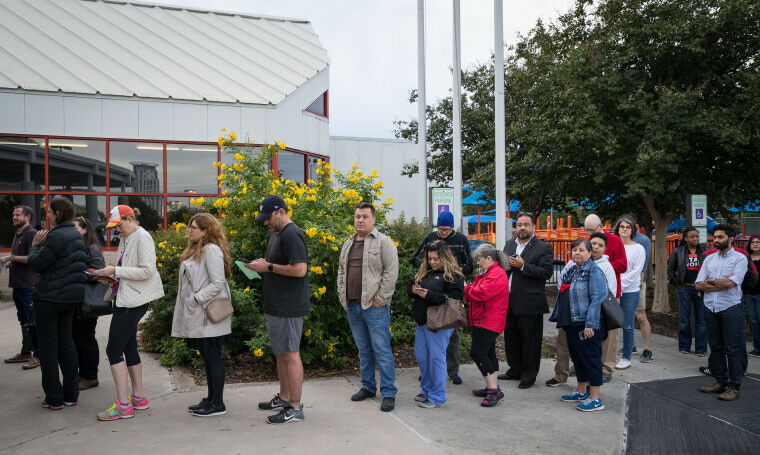 The turnout we’ll see in two weeks will be unprecedented for a midterm. The money we’re seeing — especially from Democratic candidates — is unprecedented. Also unprecedented is the fact that the sitting president is embracing that the midterms are a referendum on him. And it all underscores that this election has no real historical comparison — not 2006, 2010 or 2014. Get ready to be surprised. The NBC/WSJ poll finds Republicans with a 15-point advantage on the question of which party better deals with the economy — their biggest lead on this question in the poll’s history. Forty-three percent of registered voters say the GOP better handles the economy, while 28 percent pick the Democrats; the GOP held a 14-point edge on this question in August. Republicans also hold the advantage on trade (R+17), handling the Supreme Court nomination process (R+3) and changing how Washington works (R+1). Democrats, meanwhile, have the advantage on looking out for women’s interests (D+29), health care (D+18), looking out for the middle class (D+8) and immigration (D+4). Also in the NBC/WSJ poll, 80 percent of registered voters believe that the United States is divided. That includes 85 percent of Democrats, 85 percent of Clinton voters, 73 percent of Republicans, 72 percent of Trump voters, 83 percent of rural residents, 80 percent of suburban dwellers and 78 percent of respondents living in Urban America. And speaking of division, the NBC/WSJ poll finds that voters remain deeply divided along partisan lines over Brett Kavanaugh’s ascension to the Supreme Court, one of us writes. Notably, congressional Republicans aren’t buying Saudi Arabia’s story, either. “We've got to get to the bottom of it. In Saudi Arabia, you do not do something of this magnitude without having clearance from the top. We need to find out who that is and hold him accountable,” Sen. Thom Tillis, R-N.C., said on “Meet the Press” yesterday. By the way, a CNN poll released before the debate showed Gillum ahead of DeSantis by double digits among likely voters, and it also showed Democrat Bill Nelson leading Republican Rick Scott by 5 points. At 7:30 p.m. ET, Trump holds a rally in Houston for Sen. Ted Cruz, R-Texas.